Normally, on Monday afternoon I would be sitting in EE355 with my fellow electrical engineering undergrads learning about software design. Instead, on this particular Monday, I was standing in front of a room full of researchers at the IEEE Aerospace Conference. 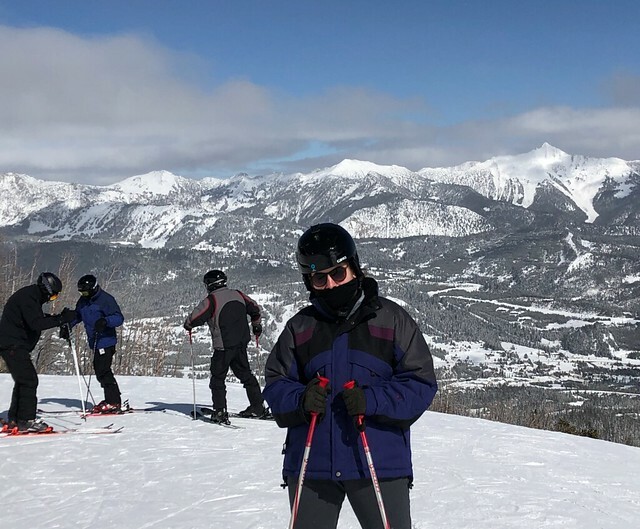 Affectionately called “I triple ski”, it’s a week-long, international, interdisciplinary aerospace conference held annually in Big Sky, Montana. I was about to present my paper “Adaptable UAV Swarm Autonomy and Formation Platform” to leading researchers from all over the world. I was there representing NASA and JPL, where I have been interning and conducting research for the last year. It all began a full two years earlier thanks to the amazing research opportunities that USC Viterbi gives undergraduates. As a freshman I had developed a great interest in using robotics for social good.This led me to Dr. Maja Mataric and her Interaction Lab. Even though Dr. Mataric is a leader in the field of robotics, she gladly took on an inexperienced but motivated young first year student and let me join her team conducting research. In the lab I worked on several projects, including one that developed socially assistive robots to work with children with Autism spectrum disorder. The full cost for me to attend the conference was paid for by the Ming Hsieh Institute and USC Women in Science and Engineering Program. That’s the type of support deserving students get here in my department. Another great thing about studying engineering at USC is the strong ties the school has to local industry. After some time in Dr. Mataric’s lab, I was confident enough to ask her if she would refer me to one of her many colleagues at NASA’s Jet Propulsion Laboratory (JPL). I had visited JPL once before in high school and that experience really stuck with me. Now I wanted to expand my perspective on robotics into a field I had yet to delve into: space travel. Dr. Mataric was so supportive and referred me to Dr. Adrian Stoica, a senior researcher in the Mobility and Robotic Systems section of JPL. With my robotics and electrical engineering experience from USC, Dr. Stoica put me on an interdisciplinary team working on a swarm autonomy platform with quadcopters. This means developing a team of UAVs that can collaboratively complete tasks such as collecting samples and mapping various objects in different terrains, with the philosophy that “two heads are better than one”. I worked on this project part time during the school year and full time during the summer this past year. That brings me back to Big Sky and the room full of researchers. Our efforts at JPL culminated in submitting a paper and that’s how I found myself presenting it at the 2019 IEEE Aerospace Conference. Our paper delves into an ongoing study where we utilized commercial off-the-shelf hardware and open source software to create a low-cost accessible platform for testing swarm autonomy algorithms, with potential use in commercial and research applications. Next to me on stage was my coworker, Divya Srivastava, a first year PhD student at Georgia Tech. Presenting my paper alongside Divya was more nerve wracking than skiing the huge slopes in Big Sky (which I also had a chance to do!). Before our presentation there were only a few people in the room and I was nervous no one else would show up. But the room soon filled up to the point where people were standing in the back…and now I was really nervous. What was I going to do in front of all these outstanding people? Somehow when we started presenting and made it to the Q&A, my nerves had subsided and I was glad the audience showed up and asked great questions. I thought about how grateful I am for these opportunities to travel, see breathtaking sights, meet amazing researchers, see their work, and share my work with them. During my few days at the conference I was constantly amazed by the researchers I met from around the world and their diverse work. In Big Sky, I felt like a small fish in the sea, but it was awesome and comforting to see familiar faces from USC. One of the professors from my department, Daniel Lidar, was there giving a Plenary talk (and yes I did yell “fight on!” much to the chagrin of the people at my table). Before I left, I had some time to explore Big Sky. I stood at the summit of Lone Mountain, 10,000 feet above sea level, looking down at the endless snow capped mountains stretching beneath me and the magnificent Lone peak looming just above. I thought about how grateful I am for these opportunities to travel, see breathtaking sights, meet amazing researchers, see their work, and share my work with them. Then, before I knew it, I was back on a plane to my home in Los Angeles. I could never have done this without the support from USC Viterbi and my coworkers at NASA JPL. They give me advice, encouragement, and opportunities every day. Not only that, the full cost for me to attend the conference was paid for by the Ming Hsieh Institute and USC Women in Science and Engineering Program (WiSE). That’s the type of support deserving students get here in my department. Roxy Pakkar is a Junior in the Ming Hsieh Department of Electrical and Computer Engineering. In addition to her research at USC Viterbi and JPL, she is a member of an all-female, all-undergrad team competing in the 2019 Maseeh Entrepreneurship Prize Competition this month.